I remember writing a blog post about another IDEO concept: Shimano Coasting. Their concept was supposed to make cycling attractive for the masses, but it eventually got dropped, what led my to question about the possible reasons for this failure. This post, is about a well-documented IDEO case: a shopping cart developped in 1998, that obviously didn’t make it to the stores… or did it? Actually it did, it just has been picked up more than a decade later, and it’s being rolled out here in France. Not by IDEO. If you watched the video, you easily understand what their concept was all about: safety for kids, modularity while shopping, easy handling and facilitated check-out. Even though the concept seems appealing to people in stores (see the end of the video), it hasn’t appeared in any store on a large scale at all. “It needs a little refining, but I thing it’s great, says the saleswoman from Whole Foods in the video, we would want them!“. 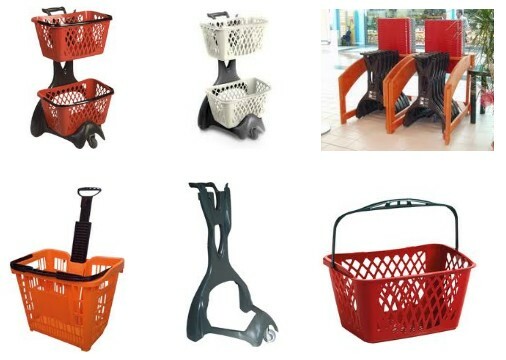 And indeed, similar shopping carts are currently being rolled out in some French supermarkets. Carrefour, the world second-largest retail chain, is on a quest of ‘reinventing the supermarket’ (see this article [French]), and design is a major constituent of their strategy. After a little bit of research, I found that these were designed and produced by the Italian company Plastimark, who started selling them in 2002. “First [Carrefour’s] customers were baffled by Plastimark carts, but they immediately loved them” we can read on their promotional material. I think they’re ugly, but they’re damn good to navigate in the narrow isles of city-stores, and they’re 100% recyclable. Plastimark also says that they’re less costly since they don’t break as often as current carts – cost effectiveness was also an advantage of IDEO ‘s concept. I never thought I would make an entire blog post about shopping carts, but the point is: IDEO had the right idea back in 1998, they were just ahead of their time. The very same concept appears today, and seems that it makes sense for shoppers. Retailers also roll-out self-scanning devices which have an ever-growing acceptance in supermarkets, that’s why I thing IDEO’s concept was visionary and I wouldn’t describe its non-adoption as a failure (even though commercially it probably was one). And who knows, maybe one day a majority of bikes will be similar to the Coasting concept !? nice post. And thanks for following up on my own work on the subject. I will add links from my blog. Keep up the good work. Ps : please note that WordPress.com can be configured so that the “accueil” button would be in English as well as all other menus. Does anyone know what happened to the IDEO shopping cart? If it is not appearing in stores, then where is it? Wanzl is producing this for a long time already.